Spicy prawn dish. Take care not to overcook prawns as they can easily turn very rubbery. 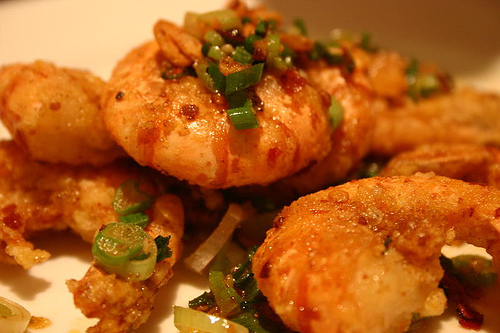 Wash prawns and marinate in 1 tbsp vinegar for an hour. Grind tomatoes with fried onions. Heat oil, add methi seeds, and jeera ,when they splutter,add tomato paste,garlic paste,and chilly paste, braise for 5 mins on medium heat. Wash prawns, add to this and add salt, mix well. Add 1/2 cup water and cook on low heat, till gravy thickens and prawn is done, add lemon cook for 2 mins. Remove from heat and garnish with coriander and julienned ginger.